All AudioInspector software products are available via an unlimited flat fee license and via Pay-per-Use license. If you are interested in an unlimited flat fee license please contact us. We will be pleased to make you an offer. The Pay-per-Use rates are indicated below. Supports recording of a single stereo stream or two mono streams from a single machine. All other features are also available as for the Quad Machine Inspector. So in terms of software costs and features purchasing four Single Machine Inspectors - besides the hardware - is comparable to just a single Quad Machine Inspector. Every software / station needs its dedicated hardware. This can also be a benefit depending on your selected settings however in terms of memory allocated to a single stream, as this version allows you to allocate 2 GB to a single stream. Supports recording of up to four stereo streams or eight mono streams on a single PC. Hardware should be a quad core PC with at least 2.4 GHz and 4 GB RAM storage. All other features are available just as for the Single Machine Inspector. So in terms of software costs and features, purchasing four Single Machine Inspectors will run you just the same as for a single Quad Machine Inspector. Hardware costs can be reduced with a Quad Machine Inspector. 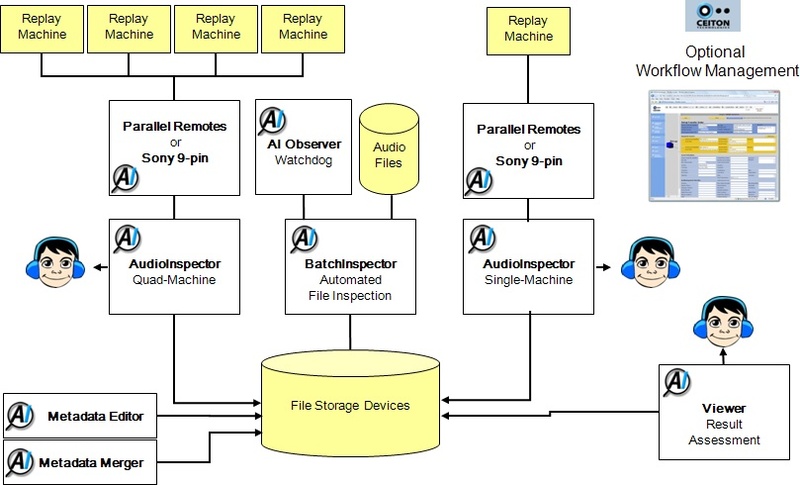 The viewer is a tool that allows opening of previously stored data with full monitoring features but no possibility for file recording or quality analysis. All features of the Single Stream or Quad Stream Inspector for verification of the results, as well as the human quality assessment, are available in this tool. It is therefore possible to verify and make final assessments of the analysis results on distributed PCs in a network. The Batch Inspector provides the same features as the Single Stream Inspector but without the ability to make recordings. The analysis always uses all available system resources. It is used to analyse already created files within the network of an organization in an automated Batch mode. Files which are dropped in a "Drop Folder" manually or by a content management system are analyzed automatically and are moved into a "Results Folder" together with the analysis results after completion. The Batch Inspector delivers status information about the progress of the ongoing processes. It also supports the integration of content management systems by automation via Webservices / SOAP. This integration will be made according to your content management systems specifications. The range of accessories for the AudioInspector is constantly expanding. In general we provide remote control interfaces and remote cables. In addition, we can also provide A/D converters and other tools. When available for the respective machine, we focus on the integration of parallel remote interfaces rather than serial interfaces. Most of the time the required serial interface cards for analogue machines have not been purchased during their usage and are therefore usually not available for most historic machines any more. If you do not find the machines you wish to use for playback listed below or if you prefer serial remote control, please send us your requirements. We are more than happy to integrate additional interfaces on demand. Allows you to capture metadata at workstations outside the AudioInspector product family. The Metadata editor can be customized to your requirements regarding entry and storage of metadata. Please contact us to discuss your requirements. Merges metadata created by AudioInspector, BatchInspector, Metadata Editor or other tools and imports it to Content Management Systems like MAVIS and others. Metadata Merger can be customized to your requirements. Please contact us to discuss your requirements. When analyzing very long audio files on 32-bit PCs in parallel your system might run out of memory depending on the files analyzed simultaneously. AI Observer monitors the analysis progress on BatchInspector and restarts the system in case of problems. We recommend to use AI Observer when analyzing long files via Quad Stream BatchInspector on 32-bit PCs. In addition these interfaces allow capturing of external status signals like C2 signals from CD players, E32 errors from DAT players or the output of optical sensors from modified open reel tape machines. Please understand that for parallel interfaces counter information is not supported by some machines. Only basic remote commands (play, fast forward, fast rewind, stop) might be available for parallel remote modules. The configuration of remote interfaces may be custom made to your requirements. Corresponding lead time might be required. Hardware equipped with a Sony 9-pin remote interface can be controlled by AudioInspector. The only hardware required is a RS-422 cable. Remote cables can be delivered upon request. When possible, we use standard cables which can be sourced at local hardware stores without the need to pay for any expensive shipping charges. AudioInspector works according to ASIO standards. Most ASIO A/D devices therefore comply with AudioInspector. The A/D converter we recommend to use with AudioInspector is Fireface™ from RME. Fireface 400™ delivers 8 analogue audio channels with a resolution of 24bit / 192 kHz (current maximum for audio A/D converters) plus 10 digital input channels at a price of around € 880 (status 08/2007). When buying Fireface™ you will also receive a software called DIGICheck - Totalyser™. This software delivers a hardware supported phase monitor, correlation meter, peak meters and a spectrum analyzer that can be used for set-up and actual recordings with AudioInspector. Updates are made available as downloads. As a registered user you will be automatically informed as soon as updates are available. In environments supported by workflow or content management systems it is convenient to access all services through the CMS. AudioInspector (Batch Inspector) can be accessed by dropping the files in a drop folder on a first come first serve basis or by using Webservices / SOAP for analysis according to a provided priority list. If you have any specific requirements for integration of AudioInspector (Batch Inspector) into a CMS, please let us know. We will be happy to integrate them for you. To preserve the content of an archive in the most efficient way it is essential to streamline and control your workflow. To do so you have to analyze your preservation process as a first. After that we recommend the integration of a workflow system that allows you to trigger and control operational processes closely. If you wish to implement a workflow system into your operation we can help you via our cooperation with Ceiton Technologies workflow systems. Ceiton is a worldwide leading vendor for workflow systems in audiovisual studio environments. For more information, please contact us at www.audioinspector.com or visit www.ceiton.de. For mass digitization of cassette tapes the use of loading robots can be a necessity to be efficient. We can supply professional custom made loading robots for any cassette format. Please contact us to discuss your requirements in detail.